Center for NDE, Iowa State University, Ames, IA-50011. Keywords: Air-coupled ultrasound, Composites, NDE of composites, Non-contact inspection. Air-coupled ultrasound has obvious advantages over conventional ultrasonic techniques. If non-contact, affordable, and versatile transducers could be used, the inspection of structures would become much easier, and the range of applications would become wider. The main limitation for using air-coupled, ultrasonic transducers has always been the acoustic impedance mismatch between most materials and air. Electrostatic, air-coupled transducers were used for the first time in 1970's for propagating waves in solids . Piezoelectric, air-coupled transducers are resonant in nature and use tone burst with a narrow bandwidth . Applications of non-contact inspection range from the aircraft and spacecraft industry to inspections in plywood and the tire industry . Composites have found increasing application in commercial aircraft structures as a result of the strength, stiffness, fatigue, corrosion, and weight benefits afforded to improve performance. Safety and functionality are high priorities for integrating composite components into commercial aircraft structures. The new B7E7 commercial plane has been designed to have composites as the primary structures. The air-coupled ultrasonic technique, with its obvious advantage over water-coupled ultrasound, has the potential for being developed into a practical NDI tool for aircraft inspection. In this paper we report our experience in using air-coupled piezoceramic transducers for non-destructive evaluation of industrial composites. The beam profile of the air-coupled transducers, transmission coefficient for a plate, apodization of transducer and bright spot in through transmission mode are the topics of interest. The focus of this research is to supplement the development of non-contact air-coupled inspection technique for inspection of composite structures. TABLE 1 Insertion loss in common materials using 120 kHz planar transducers. The equipment used to obtain the results presented in this paper was the Sonda-007CX AirScan from QMI, Inc. C-scan images were produced by using a commercially available raster scanning system from Sonix, Inc. The transducers used were piezo-ceramic and ranged in frequency from 50 kHz to 400 kHz. The impedance mismatch is huge between air and most materials. Table 1 gives an idea on the amount of energy lost in transmission when using air as the coupling medium. Common materials available in the laboratory were placed between the transducers in a through transmission setup. The measured insertion loss for different materials is listed in Table 1. A sheet of paper causes an amplitude loss of about 38 dB and a sheet of saran wrap has a loss of 25 dB at 120 kHz. These insertion loss measurements led us to find the transmission coefficient for plates of different thickness. where m = ZI / ZII and c is the velocity of sound in the plate. If the incident wave is of unlimited duration (single frequency, f); it would setup a series of mechanical resonances in the plate. The sine-squared term in (2) makes the expression a periodic series of sharp peaks with the transmission coefficient reaching unity at each resonance (see Fig. 1). In deriving this expression for transmission coefficient, a single frequency incident plane wave is assumed. However, the transducers used for the measurements have a frequency spread. A modified transmission coefficient is therefore needed to account for the frequency spread of the transducer. FIGURE 1 The transmission coefficient in aluminum and CFRP plates. The maxima occur when the thickness is an integer multiples of c/2f (c is the velocity of sound in the material). FIGURE 2 a) Time-domain signal of a 120 kHz planar transducer, b) The frequency spectrum 120 kHz planar transducer. The above formulation for the modified transmission coefficient was verified experimentally using the 120 kHz planar transducers. The amplitude loss was measured by keeping the air-gap between the transmitter and the receiver at 2.5". Aluminum and Carbon Fiber Reinforced Plastic (CFRP) plates of different thicknesses were inserted between the two transducers and the amplitude of the transmitted signal was measured. The difference (in dB) for only air and for a plate between the transmitter and the receiver is the actual insertion loss for a plate of thickness d.
A computer program was written in Matlab to calculate the insertion loss based on the modified expression for the transmission coefficient in (4). The program calculates the amplitude loss in dB at different thicknesses for a plate material. These calculated values were then compared with the measured values by using 120 kHz transducers. The measured and calculated amplitude loss in dB for aluminum and composite plates at different thicknesses is plotted in Fig. 3. These plots show good agreement between the calculated and measured insertion losses for both aluminum and CFRP plates at different thicknesses. Therefore, this model can be used to predict the thickness-dependent insertion loss for a variety of materials. In the through transmission scan setup; the two transducers are situated on opposite sides of the part being inspected. One is the transmitter and the other a receiver. A flaw inside the sample tends to block the transmitting signal and appear as a low intensity feature when compared to its surrounding in the C-scan image of the part. Interesting results have been observed in the inspection of various composite laminates and honeycomb structures. In some of the scans, defects appeared as higher intensity regions than the surrounding regions or as a region with a bright spot in the center. Figure 4a is a C-scan image of a 10 ply CFRP facesheet using 400 kHz transducers with a focused receiver. The facesheet has embedded circular defects of three different sizes and triangular defects. It is a perfect example of a through transmission scan. FIGURE 3 Comparison of measured and calculated amplitude insertion loss in aluminum and composite plates of different thickness. As expected the embedded defects show up as lower intensity regions in the scan. A honeycomb sandwich was made by gluing this facesheet with embedded defects on one side and a normal 10 ply facesheet on the other side. The aluminum honeycomb core was 3/4" thick with 1/8" cell size. A C-scan was then performed on this sandwich using 120 kHz transducers (Fig. 4b). An interesting phenomenon was observed where some of the embedded circular defects showed up as bright spots instead of dark spots. We believe that the bright spot phenomenon is caused by the diffraction of sound waves around the circular defects. The diffracted sound waves interfere constructively to generate bright spots. This phenomenon, first observed in optics in the nineteenth century, went by the name of "Poisson's bright spot" . In the optics case, a bright spot was found at the center of the geometrical shadow of a circular disc when a point source of light was projected on to it. An analogy can be drawn from the Poisson's bright spot observed in optics to the bright spot phenomenon observed in our experimental results described above. The sound waves diffract around the edge of the circular defects and interfere constructively to produce a bright spot. To test this theory, a model for the diffracting sound waves around the circular edge was formulated after Fresnel's wave theory of light. The model calculations for the intensity were compared with the experimental results using a pair of 120 kHz planar transducers. FIGURE 4 (a) C-scan image of a 10 ply CFRP face sheet with embedded defects at different depths as shown. The image was obtained using a 400 kHz transducers with a focused receiver (b) A C-scan image obtained with 120 kHz planar transducers on an aluminum honeycomb sandwich containing a facesheet shown in (a). Some of the defects in the facesheet show up as bright spots. FIGURE 5 A schematic view of the physical arrangement for the experiment is shown along with the notation used to indicate distances. P is the point source of single frequency ultrasonic wave. The distances a and b are from the circular object to the source and the screen respectively. Lommel developed a special formulation of the Kirchoff theory in 1885 to explain the Poisson's Bright Spot phenomenon. This formulation is suitable for the calculation of intensities beyond a circular obstacle or aperture. Many researchers after him have tried to refine the method to obtain more accurate results for large-scale diffraction patterns from circular objects . 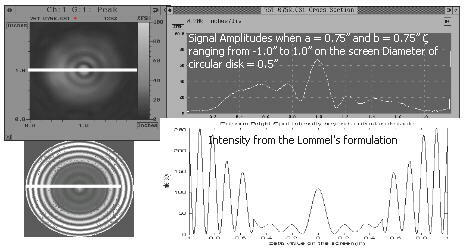 In this research, Lommel's formulation from the wave theory of light was applied to ultrasonic waves. The diffraction pattern for ultrasonic waves beyond a circular obstacle is calculated. These diffraction patters are then compared with the experimental results obtained using air-coupled planar 120 kHz transducers. Where V0 and V1 are Lommel functions defined as an infinite series of Bessel functions of the first kind. A computer program was written for calculating the intensities beyond an obstacle using this formulation. Consider a point source projecting 120 kHz ultrasonic waves onto the obstacle. FIGURE 6 Intensities beyond a circular disk when a=0.75" and b=0.75". Qualitative comparison of measured and calculated intensities beyond a circular disk (0.5" dia.). The inputs for the program are distances a and b, frequency of the point source and the radius of the circular obstacle. The results from the computer code were compared with those obtained using air-coupled 120 kHz planar transducers. The 120 kHz planar transducer has a toneburst of 80 to 100 µs long (Fig. 2a). In these measurements circular disks with diameters varying from 1/8" to 1" were used to study the diffraction pattern. In the setup used for the experiments the transmitter was stationary and the point receiver scans the amplitude beyond the circular disk. Keeping a=0.75" and b=0.75", a scan was performed to map the field beyond the circular disk of 0.5" diameter. Fig. 6 shows the scan result and its comparison with that obtained from the Lommel's formulation. It is noted that the experimental result showed qualitative agreement with the central portion of the calculated result. The large amplitude oscillations in the calculation away from the central axis were not seen in the experiment because the disk blocked most of the incident beam. Diffraction and interference effects are more easily observed in air-coupled ultrasonic testing than in water-coupled testing. Air-coupled ultrasound can be used for inspecting a variety of materials and structures. Luukkala M. and Meriläinen, Ultrasonics. 11 (1973) 218-221. Loertscher H, Grandia B, Strycek J and Grandia W.A., NDTnet, www.ndt.net/article/qmi/qmi.htm ; 1(09)(1998). Curlin Air Tech Note, NDTnet, www.ndt.net/article/1298/ndts/ndts.htm ; 3(12)(1998). Philip M. Rinard, American Journal of Physics, Vol. 44, No. 1, Jan. 1996.